Prepare a basic pancake batter, we use 80g flour, 1 egg, 140ml milk, 20g soft butter and leave to rest. Heat a crepe pan or non stick frying pan on medium. Fry slices of salami in the pan for a minute, pour over a ladle of batter, swirling to cover the salami. Cook for 1-2 minutes until the surface is dry. 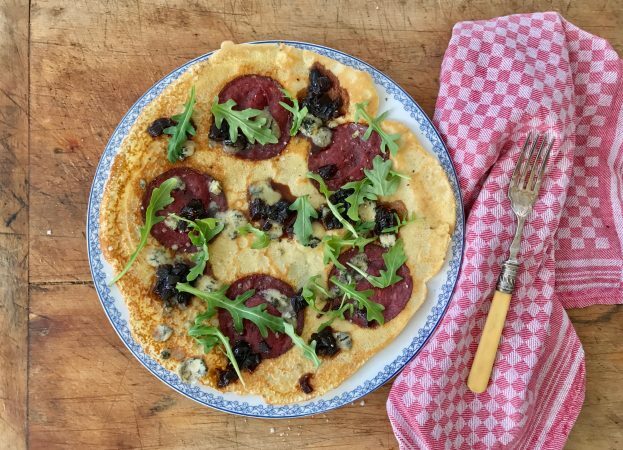 Flip over, sprinkle with grated blue cheese and small dollops of red onion marmalade and cook for another minute. When cooked trough transfer to a plate and sprinkle with rocket leaves.